The following message comes from Wesley and is posted here with his permission. 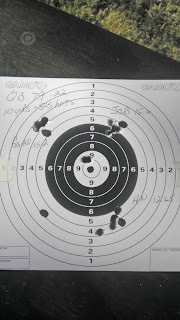 "Here is a photograph of the accuracy of a QB79 .22 caliber. The gun was sighted in at 25 yards by me using Crosman HPs and a fixed 4 x 32 AO Winchester scope. The target was shot by me from a bench at 10 yds. Center to center group was three shots with CHSs to see where the pellets hit at 10 yards. Top left Gamo 15.21 gr pointed 5 shots. Top right JSB Exact 15.6 gr dome 5 shots and lower right was H&N 12.65 gr Hp also 5 shots. Archer Airguns built this gun for me in November with XP Tune Kit, tuned valve, HDD. You can always spend more, but for me you won't get better." Click the image for a larger view of Wesley's test target. Wesley, thanks for your comments. That's great shooting! Note, Wesley ordered his gun through Archer Airguns QB79 Custom Shop.